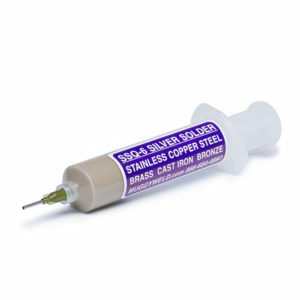 A stainless steel threaded bolt is soldered to a brass nut using SSQ-6 silver solder paste in syringe form. Make sure both parts are clean before starting the solder process. In this demonstration we use a propane torch, but oxyacetylene and MAPP gas are also acceptable torches. After finishing the braze, SSQ-6 is as strong as a MIG weld.